I am a computer’s worst nightmare, but a programmer’s best friend. I am both the cause of a problem and the source of its resolution. What am I? puzzling.stackexchange.com/questions/57726/… answer is clearly satire, flag for rudeness? can't you delete your answer now? I thought it was pretty funny.. nobody got a laugh from it? Q: How do I solve this odd puzzle? @Sid It's not ESQUIRE by any chance is it? Familiar? Hell, I live in one! 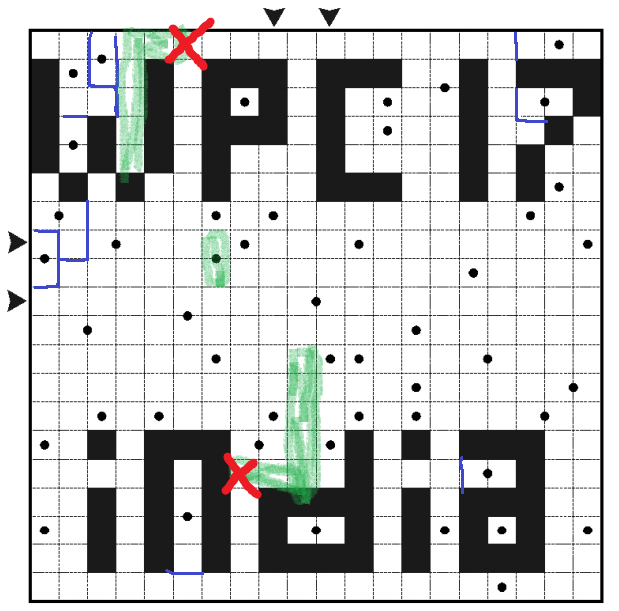 And no, I'm not a competitor in the WPC2017 so don't worry, this isn't for a competition. do you ignore the black squares, or do they "block"? 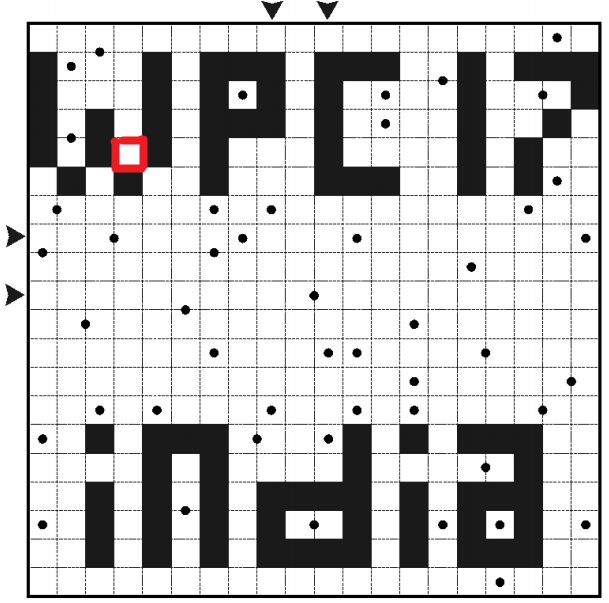 @Wen1now what is the objective of the puzzle? Q: When is a quarter closed door the same as a quarter open door? A half open door is always the same as a half closed door. And of course it is not a door when it is a jar. Hint: We're not talking about clopen doors. All our buildings are very simply connected, thank you. What could be the answer? wait.. do the rules say that all white squares need to be part of a galaxy, or can there be "holes"? You've got to fill the whole thing, yeah? @Ankoganit Could the 4C be "CHANCY"? @EricTressler which c4 are you talking about? @Sid "CCCC: Could be, maybe, possibly, perhaps, not having one probability? (6)"
So... that is a quintuple def? The game here seems to be to throw random six-letter words at the clue and see what sticks. Q: Is cross-posting a question on multiple Stack Exchange sites permitted if the question is on-topic for each site? probability=P; possibly perhaps=(PERHAPS)*; "Could be, maybe" = PHRASE as def by example? I need to give an explanation ? That would be an anagram of (RUST)* in the outer letters of silence. You'd need an indicator for both. Or an anagram of RUST and SE, rather. And how does surest mean cover? @Skyvask Basically, you figure out how to split the clue into either "[definition][wordplay]" or "[wordplay][definition]". And the indicator words in the wordplay need to match what's there. I wonder if rust is FE or FEO. Rust is Fe? But that's iron! Is "TINSIL" an alternative spelling of "TINSEL"? I FINALLY SOLVED IT. AAAAAA. THIS PUZZLE, HAS BEEN SITTING UNSOLVED FOR YEARS. That looks like a really weird Rubik's cube. That's a good idea, but isn't it the rust that's doing the eating? I mean you could say "the knife has rusted" or "rust has eaten the knife", no? Yes, I know, but the verb to eat isn't used in the same way as the verb to rust, no? It's.... it's a little silly. 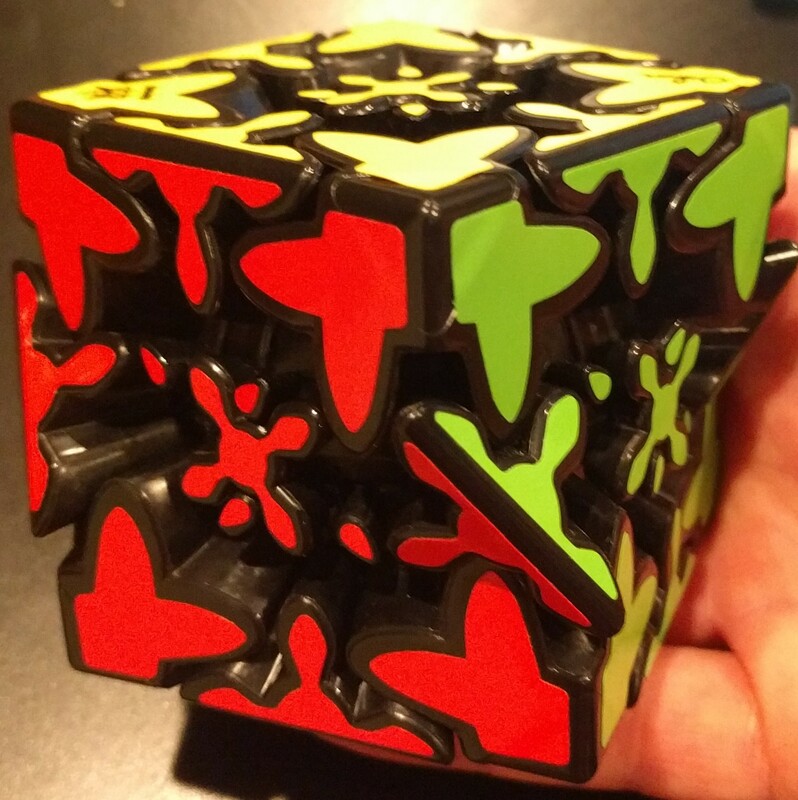 You just need a way to switch the positions of three pieces to solve it, honestly. If you have a three-cycle, you pretty much win. It's just like, getting that three-cycle is a paain. automotivespecialtiesinc.com/… "[...] road salt can rust your car" - found rather quickly via google. "<foo> can rust <bar>" is valid idiomatic usage. Okay, point taken. My dictionary lookup didn't support that usage. "Again what learned", as they say around here. and with that i'm off to rust. er, rest. @Sp3000 oh wow that surface is really nice! @Skyvask yeah, that was pretty blatantly off topic. I just cast the final close vote. But the screenshot was of translating "couverts" from English into French. I can reproduce that punctuation-fest. oh, it was backwards. I failed to notice that. So yeah, I can indeed reproduce it. Entering other French words into the English side of an E->F translation doesn't produce such glories, though. At least not the ones I've tried so far. I am the hidden land Where man may not tread but wildlife can Here a group in full did travel By peak twilight, by horse and paddle The group spoke sin and thus went in To rule over all within Where am I? I am a computer’s nightmare, but a programmer’s best friend. I am both the cause of a problem and the source of its resolution. What am I? I wasn't sure if I'd made my riddle too difficult or too easy. @StevenVascellaro This worked really well because the solution was "obviously better than the rest". There have been some, like this one. You have digits 0 to 9. You have to find the lowest number possible for the difference of 2 5-digit numbers. e.g. 98765 - 43210 = 55555 What is the lowest number you can get? Also add a explanation please. Thx. > My life was a half-empty glass. Now it's half-full again. Q: Is this riddle too obvious? My friends hate me, my enemies love me, my leader puts a leash around my neck, my enemies reward me and beg. What am I? I go to great lengths for you to understand I never change my stripes, I stick to what you planned I bend and reach for you, in any given frame With no delay, on your command, I'm back to whence I came What am I?